Last week I went to spend the day at my kids' school. I visited several different classes, and mostly did basic school volunteer things, as part of a dad involvement program called Dads of Great Students (D.O.G.S.). It's hard to remember any of the specific questions they had, but I tried to show them that juggling involves breaking motions down into small, easy-to-master movements. I actually tried this method out for myself this weekend for the first time, in preparation for leading a bunch of cub scouts through this craft. It's really fast and easy, and makes beanbags that are excellent for juggling. I first saw this via the Texas Juggling Society's booth at the recent Maker Faire here in Austin. I looked for other writeups on the net, but didn't see any that used the bottle trick I'll be describing below. A variant method using a plastic bag is here. All you need are some balloons (9" or 10" round are good), an empty plastic soda/water bottle, some birdseed, sand or rice for filler, a funnel, and a measuring cup. I used these specs: 1/3 cup birdseed per beanbag, and 9" balloons. Cut half the neck off one balloon. Use funnel to put 1/3 cup of your filler in the plastic bottle. Stretch the balloon's neck over the rim of the bottle. Invert the bottle to let the filler slide to the bottom. Squeeze the bottle to force the filler into the balloon. Pull the balloon off the bottle. Cut all of the neck off of a second balloon. Stretch the opening and wrap the 2nd balloon around the first. It's not hard to do. Make sure the opening of the 2nd ballon is away from the opening of the first, so that tension will hold the filler trapped inside. Repeat with a third balloon for strength and durability. You can make a set of 3 balls in about 10 to 15 minutes this way. Looks like I'll probably do a benefit show in February, opening for Joe McDermott, who has a musical act for kids and who lives in our neighborhood. Maybe. Nothing confirmed yet. Pretty exciting, though. Joe's audiences are always great. I don't do a lot of benefit shows. I'd rather be paid, generally speaking. But this one's for my kids' school trip. I also do the school's fall festival every year. And if you've never been to a Joe McDermott show...well, you should go. He's a lot of fun. Everyone in our family sings his songs. He typically mixes a variety of musical styles into his albums, so there's a lot of musical and lyrical interest for adults as well as kids. Well, things at the wedding weren't quite what I expected. It was outdoors and there was a lot of wind...not ideal conditions for my act, which depends heavily on verbal patter. And most of the time it didn't seem appropriate to start up any juggling. But during a lull in the reception, I did get some items out, especially the spinning plates. My son Ethan actually started us off with some plate spinning; he's getting good at it. I was able to let several kids try it out, and do a few tricks myself, before we all went inside for the toasts. I expect I'll get a wireless microphone set at some point. It's nice to not worry about speakers and wires and sound systems, but it's limiting in a lot of venues. It's nearly impossible to be heard in a windy outdoor environment without amplification. The Texas Juggling Society had a booth at the Maker Faire this past weekend, showing homemade juggling props. Among these were examples of Green Clubs, which are clubs made mostly from recycled materials. Homemade clubs can do a lot to lower the bar to entry for aspiring club jugglers, as you can easily pay $30 per club if you buy professional-style clubs. The construction methods have been refined. For example, the process includes cutting a tennis ball in half. I've heard lots of stories about people hurting themselves trying to cut tennis balls. This procedure includes instructions for how to mark and cut the balls accurately. If you're interested in juggling clubs, and feel at all crafty, give this article a look. 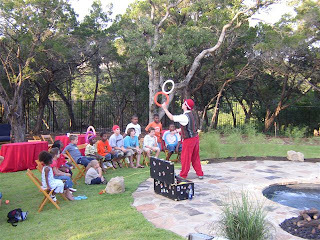 Here's a photo from a stage show in 2005...the Texas Juggling Society's public show. A friend of mine has asked me to possibly perform at her wedding. I've never performed at a wedding before. Since it's happening in two weeks, I'll clearly be performing more or less my existing repertoire, but my usual costume and Grandpa's Trunk frame story might not work. I love performing for adults and for mixed adult/kid audiences...the adults get more jokes and get them faster than the kids. But I am not sure how to frame my show to work best in the formal setting of a wedding. I'll have to think about this one. I'm sure there are some fun ideas that can be applied. And I'll bet what my friend is wanting is some entertainment during otherwise dead time at the reception....something I'm sure I can provide. Should be interesting, though. I've done a lot of different venues, but not a wedding. Some traffic on the Texas Juggling Society mailing list linked to some dice stacking videos. This is a trick I'd seen before, but looking at the video recently made me want to learn how to do it, so I found a video that describes how it's done. If you've never seen dice stacking, you should really just watch one of the videos on YouTube (here's one); it's a seriously odd idea....using an inverted cup in constant motion to grab and then deposit dice on a table. I mention it here because at first glance this stuff really seems like magic, but watching a tutorial made it seem doable...with lots of practice. Last week I picked up three stainless-steel grill knives at Academy. They're shiny and they have long round handles. They were ridiculously cheap: $2 each. They had metal loops on the ends for hanging them up; I was able to remove those with pliers. I anticipate that they'll make great juggling knives. I've been using grill knives that I got at Goodwill for about the same price, and those had flat handles that were not as nice to juggle, and the handles were wood. The contrast between the wood handles and the metal blades emphasized the long handles...I think the all-metal knives will look much more dangerous. They're certainly shinier. Knives made and sold for juggling cost as much as $30 each, so I'm happy to try some for a lot less. I'd insert the usual pro forma disclaimer here...don't try this at home, kids don't do anything crazy like juggling a knife...but since I do it, that would be silly. Instead, I'll note that careful, close-up inspection of any knife actually juggled tends to reveal that it is quite dull, and that I plan to show my knives to a grindstone for that purpose, until they have an edge almost a millimeter wide. That's pretty dull, and yet still not something I want landing on an arm, a toe, or a face. Especially not mine. Also, it's really stupid to play around with a juggling knife over a laminate floor. Don't ask me how I know that. 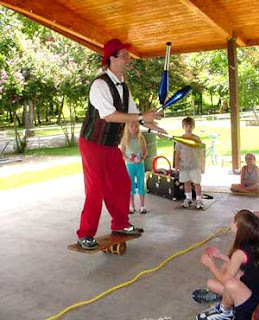 The Georgetown library asked me to do a juggling seminar in addition to my usual show this past Thursday. I ran one for about an hour and a half after my half-hour show, and it went well. I think it went well because we organized it well, and because it was not a venue where parents left their kids unattended; I think nearly all the kids had a parent in the room. Plus there were several volunteers on hand to help with the kids, so I was able to divide the kids into smaller groups after a while. The format I used was to teach everyone the basics of three-ball juggling, then set up stations with other props for folks to try out. I offered plate spinning, ring juggling, devil stick, and cigar box stations. Some of the moms got into the act, too, and made significant progress towards three-ball juggling in just one session. 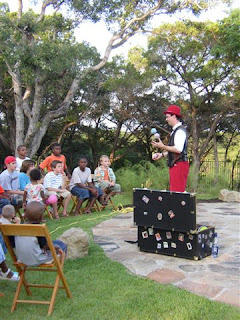 I have a show this Thursday, 2 pm., at the Georgetown library in Georgetown, TX just north of Austin. The show is free and open to the public, courtesy of the library. After a half-hour juggling show, I'll be hosting a 45 minute juggling seminar. The show is aimed at ages 7 and up. I've done a lot of plate spinning in the past week or so and I thought I'd mention it here, because it's an easy juggling trick to pick up, and it might encourage newcomers to the hobby. The essential thing you need for plate spinning is a trick plate. Spinning plates have a special rim on the underside and a cone-shaped indentation to help stabilize the spin. Along with a plate, you need a stick....I use a quarter-inch diameter dowel sharpened on both ends. Once you learn to spin a plate -- and I've seen adults and kids manage to do it after a few minutes of practice -- there are several tricks you can learn to do with the plates. Some decent plate-spinning instructions can be found here. Plastic spinning plates are not expensive; many juggling suppliers sell them. Here's one. My 10-year-old son has been having good luck learning to spin plates lately. Anyone with sufficient hand strength to hold a plate up on a dowel ought to be able to do it. After you learn to get a plate spinning, try tossing it in the air and catching it, and then try flipping the stick during a toss. 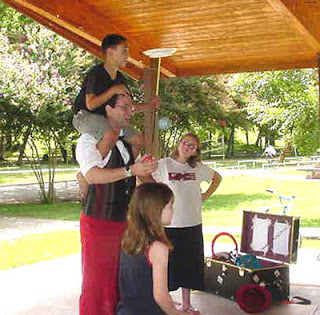 I like to hand a spinning plate to a kid to hold, and because it's a pretty easy trick, I complicate it by putting a kid on my shoulders, getting two plates spinning on sticks and having the kid hold them, then juggling with the kid on my shoulders. Contact juggling tricks with two balls at once. For example, balance aball the top of each hand, with the hands held flat in front of your chest. Simulataneously roll the balls to the other side of each hand while rotating the arms at the elbows, so that you end with the balls on the palm of each hand and you're standing with hands out, palms up. I can almost do this one. Twist and juggle: I can do this. 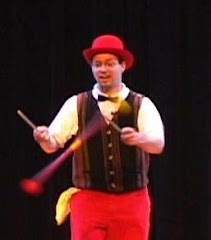 I hadn't tried before: While juggling 3 balls, twist the body until you are facing backward, juggling all the time. Then return to the front. Your feet never move. Then do the other side. It's like stretching while juggling. Stretching while juggling: I did several moves that involved taking long low stances with the feet wide apart, or stepping left and right while juggling. The idea was to maintain a wide pattern, sometimes so wide that I had to step from side to side to catch the throws. I don't usually spend a lot of time with the balls or the devil stick, so having them as my only props led me to focus on them in interesting ways.